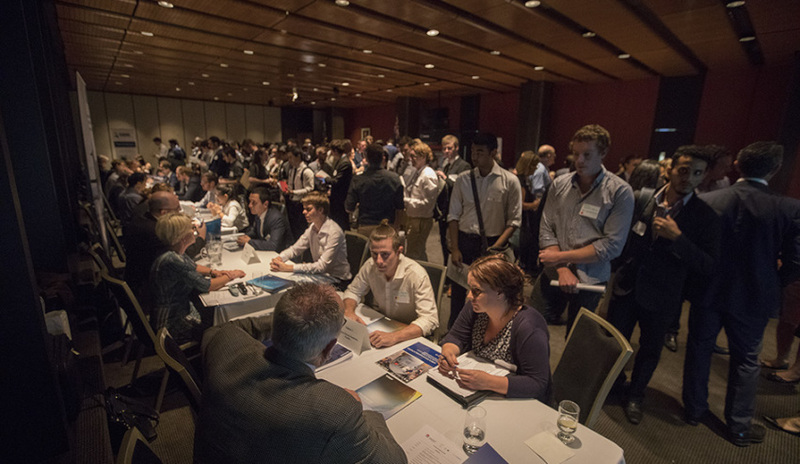 [email protected] on Tuesday night gave 138 students from NSW universities the opportunity to promote themselves to Australian defence primes, with representatives from Airbus, ASC, BAE Systems Australia, Boeing, Broadspectrum, DST Group, Raytheon, Rheinmetall Australia, Rockwell Collins Australia, Saab, SADIG, Thales and Varley all in attendance. NSW Minister for Primary Industries Niall Blair, NSW Defence Advocate Air Marshal (Ret’d) John Harvey and Special Minister of State Anthony Roberts also attended and spoke about the growing opportunities within Australia's defence industry sector on the back of the 2016 Defence White Paper. Minister Blair discussed the recent release of NSW Defence and Industry Strategy and the importance of developing students for jobs in the industry. "We released the strategy here at Parliament because NSW is a defence state and you've been hearing just quickly about some of the key industry partners that we have here in NSW," he said. "Heading up into 2026, the Commonwealth Defence White Paper has about $196 billion that's going to be directed and spent in this industry. "And NSW wants to make sure that we get a key part of that, and that's what tonight is also part of, is making sure that in order for us to do that, we've got the right minds and the right people in the industries that are based here in NSW to deliver upon that." NSW Department of Industry executive director for industry development Duncan Challen also stressed the need for equipping NSW students with skills for defence jobs of the future, as well as the opportunity for Australian businesses over the next decade. "The future of prosperity is linked to every one of you that are here tonight. We need to ensure that we have the people with the rights skills for the jobs of the future," Challen said. "The NSW government has launched its Defence and Industry Strategy, we've created a unit called Defence NSW and now we're working closely with the universities and defence industry to make sure we can get the right people with the right skills for the jobs of the future. "We've got a once in a multi-generational opportunity that has presented itself: $195 billion worth of investment by the federal government in defence projects over the next 10 years. Unprecedented. And that means opportunities, not just for defence but for businesses; big, small, startups, across the range." And it seems the future is looking bright, with the students in attendance wasting no time to pitch themselves to the industry, leaving a positive impression with key players. Angela Cusack of Rheinmetall Defence Australia and New Zealand praised the engagement and interest of the students at the event. "I think it's been fantastic, they have been so impressive as a group of students in the sense of their interest, their enthusiasm in the industry, their organisation in how they've turned up with their resumes, their academic transcripts and it's just been a line of students seeking to talk to us. It's really impressive," Cusack said. Anne Bettens, 23, who is studying for her Masters in Aerospace Engineering at the University of Sydney after completing her undergraduate degree in Western Australia, is planning for a career in aerospace and attended the event to meet potential employers. "I am very interested in space. I have always been obsessed with space and have always wanted to be an astronaut, so I continued on to get a degree in aerospace engineering and hope to pursue a career in it. "I went to the Defence [email protected] with an open mind - I’m really interested in career opportunities in Australia if they are here and I wanted to learn as much as possible about different companies that are working in aerospace."